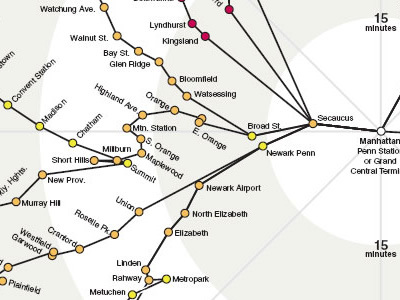 This map shows the travel times, in minutes, from Manhattan to stations in the region's commuter rail system during the evening rush. Each alternating ring shows how much farther you can travel in an additional 15 minutes. Inbound times may differ. Lines that appear to double back on themselves indicate when stations farther from Manhattan have shorter travel times because they are served by express trains. Color-coding indicates how fast, on average, thetrain travels to reach each station, from red (15-25 mph) to green (45+ mph). 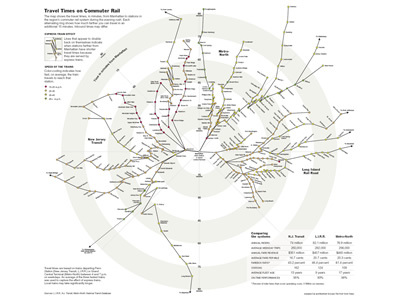 Travel times are based on trains departing Penn Station (New Jersey Transit, L.I.R.R.) or Grand Central Terminal (Metro-North) between 4 and 7 pm on weekdays. An average of the three fastest trains was used to capture the effect of express trains. Local trains may take significantly longer.